Back in the 1990s, critics of the dot-com bubble used to point out that the global economy depended on the US stock market and the US stock market depended on, like, ten Internet stocks with negative aggregate earnings. The resulting inverted financial pyramid was, the critics claimed, very easy to tip over. The clobbering that tech shares have taken in recent days has magnified not only how influential these companies have become in people’s everyday lives, but how much sway they have gained in global stock markets. 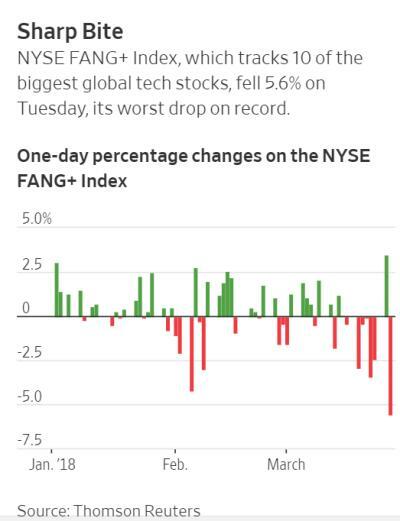 The NYSE FANG+ Index—which tracks 10 global tech heavyweights, including Facebook, Apple, and China’s Alibaba Group Holding — fell 2.2% Wednesday, extending losses after suffering its worst one-day drop since September 2014 on Tuesday. Investors are concerned that the tech giants have grown so much and so fast in recent years that they now have outsize influence on the broader stock indexes. Their rapid gains have come alongside heavy inflows into passive funds that track indexes like the S&P 500, leaving millions of investors susceptible to greater downside should tech stocks struggle more. In the U.S., Facebook has been the worst performer among the big tech companies, falling 13% this year amid controversy over how it handles users’ data. Chief Executive Mark Zuckerberg expects to testify before Congress about the company’s privacy and data-use standards, in what would be his first public testimony before lawmakers. Shares of Apple and Google parent Alphabet are also down for the year, faltering in recent weeks on concerns that tech firms face tighter regulation. Amazon.com and Tesla both components of the NYSE FANG+ Index, were among the weakest performers Wednesday. Amazon fell 4.4% and closed in correction territory—off more than 10% from its March 12 high—amid speculation that the White House wants to clamp down on the e-commerce giant’s growing dominance. Tesla, meanwhile, slumped 7.7%, extending its Tuesday’s tumble, amid an investigation into a fatal Tesla crash and following a Moody’s Investors Service rating downgrade on the electric auto maker’s debt. Selling in Telsa bonds also intensified, driving the price of its unsecured debt to new lows. As of March 12, Facebook, Amazon, Apple, Microsoft and Alphabet had accounted for 45% of the S&P 500’s year-to-date gain, he said, indicating just how central they have become to index moves. Facebook, Amazon, Netflix Inc. and Alphabet together account for a 7.8% weighting in the S&P 500, more than double what its level was five years ago. The overall tech sector now has a 26.8% weight in the S&P 500, making it by far the largest component. Financial stocks, in second place, account for 16.8%, according to Thomson Reuters. Investors piled into hot technology stocks last year and reaped outsized gains. Now the sector’s sharp reversal stands to have the opposite effect. High-flying companies including Microsoft, Alphabet, and Facebook, were among the most widely held last year by institutional equity strategies, such as pension funds and endowments, according to eVestment data. In the final three months of 2017, more than 22% of such portfolios held Microsoft, up from less than 21% a year earlier, making the technology giant the most widely held. Alphabet, the second most owned company, was in nearly 22% of portfolios in the fourth quarter, up from less than 21% a year ago. And Facebook, the sixth most widely held company, was in 16% of portfolios, versus 14% a year earlier, the eVestment data show. Apple and Amazon, technically a consumer stock, also cracked the top 10 in ownership breadth. Data across the industry show a similar trend. Amazon, Facebook, Alphabet, and Microsoft were all in the top five on Goldman Sachs’s list of stocks that are most often among the 10 biggest holdings for hedge funds at the end of last year. Holdings of technology shares were a key reason many active managers beat their benchmarks in 2017. That sets up big investors who still own these shares for outsized losses as the technology selloff gathers pace. The S&P 500 technology sector is down nearly 6% so far this month, including a 0.9% decline on Wednesday. The S&P 500 is down 4% this month. Those shorting the stock grouping have been gaining recently. Short positions on Apple, Amazon, Facebook, Netflix, and Alphabet, which together are valued at $24.6 billion, have made $3.5 billion in paper profits since March 19, according to S3 Partners, a financial analytics firm. What this means is that index funds and ETFs – by far the most popular kinds of funds for both individuals and pensions – buy broad sections of the market or its sub-sectors without attempting to separate good from less good stocks. If Amazon accounts for a bigger part of the S&P 500 then a fund tracking that index has to buy more Amazon stock regardless of whether it’s wise to pay 232 times this year’s earnings. Which is fine while everything is going up. But when former darlings, i.e., “crowded trades” start falling the engine is thrown into reverse and index funds are forced to sell, pushing the market down and forcing more sales, and so on, ad — potentially — infinitum. Meanwhile, hedge funds have largely given up trying to exploit deep patterns and historical price anomalies and are just riding the trend: “Holdings of technology shares were a key reason many active managers beat their benchmarks in 2017.” If what’s coming is in any way reminiscent of the dot-com bust, these geniuses who “outperformed” the market by buying overpriced tech simply because it was rising will soon be notable mainly because their funds are closing after massive losses. 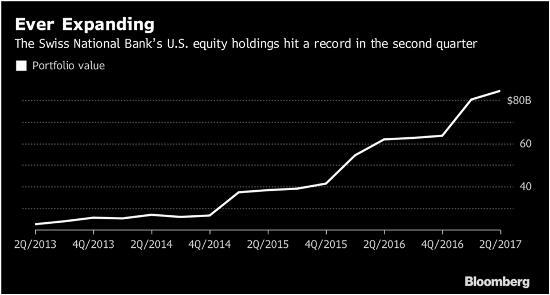 (Bloomberg) – The Swiss National Bank’s U.S. equity holdings gained almost 5 percent in value to hit a fresh record in the second quarter, thanks to a buoyant stock market. The portfolio increased to $84.3 billion from $80.4 billion at the end of March, according to calculations by Bloomberg based on the central bank’s regulatory filing to the U.S. Securities and Exchange Commission published on Wednesday. The value of the SNB’s U.S. share holdings has risen over the years as its pile of foreign-exchange reserves expands and thanks to rallying markets. The central bank led by Thomas Jordan has accumulated foreign exchange worth 714.3 billion francs ($742 billion) due to its interventions to tame the franc’s strength, and has invested those assets in both stocks and fixed income products. It held 20 percent in equities at the end of the second quarter. We won’t know until after the fact whether this is the end of an epic bull market or just a squiggle on the way to new highs. But if it’s the former, a lot of complacent investors at every level of financial society will be wishing they’d paid a bit more attention to that “risk” thing.